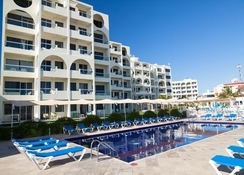 Sitting at the entrance of Cancun's prestigious Hotel Zone and overlooking the fine turquoise Caribbean Sea on a private stretch of fine white sand, is the Aquamarina Beach Hotel Cancun. 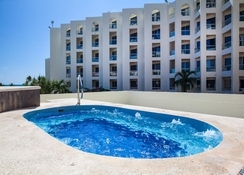 Oozing Mexican charm and warm hospitality, this 4-star property has fun activities, excellent food and first-class services available at arm's length, with facilities including an outdoor pool and solarium, a gym, mini water park, daily sports and leisure activities, evening entertainment and more. 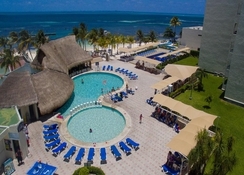 Aquamarina Beach Hotel Cancun has pleasant, modern rooms and suites divided into two categories providing comfortable amenities and gorgeous views of the Caribbean Sea and Isla Mujeres. 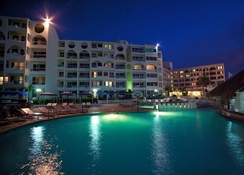 The hotel's six restaurants and bars serve quality food and drinks, suitable for all tastes. 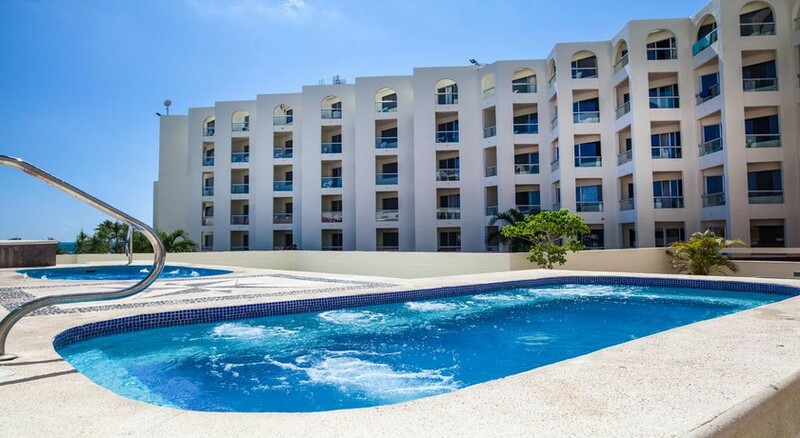 Aquamarina Beach Hotel Cancun is positioned at the beginning of the Hotel Zone, meaning it's in the heart of the action with a selection of bars, restaurants, shops and tourist attractions nearby. The Cancun Interational Airport is located 23.5km away and takes about a 30 minutes to drive from the hotel. The hotel features its own private beach, making the distance to beach only a few hundred metres from the luxurious rooms. The hotel offers 72 rooms in total and is renowned for its spacious and plush interiors. Rooms here include amenities such as a balcony or a terrace, air conditioning, flat screen TV, in-room safe, iron and ironing board, hairdryer, free WiFi and much more. Guests can choose between Standard Rooms, Junior Suites and a Penthouse with two bedrooms - depending on whom their travelling with. 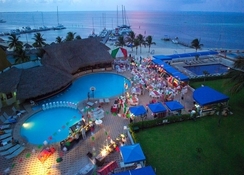 There are several restaurants to choose from – Las Perlas and La Palapa. Las Perlas is the hotel's main restaurant and is open daily for buffet breakfast, lunch and dinner. La Palapa is a buffet restaurant open for lunch and dinner, with International dishes, amid a traditional Caribbean setting. La Parrilla is a snack bar serving light snacks for lunch. There are three additional bars to unwind after a long day at the private beach. 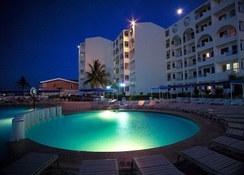 The hotel features a swimming pool with a swim-up bar. Guests can lounge by the outdoor jacuzzis or sunbathe at the solarium. Sport activities at the hotel include mini-golf, table tennis, beach volleyball, football, basketball and aerobics. Watersports activities include paddle boats, kayaking and snorkelling. The hotel also offers a children's playground. Evening entertainment including live music and shows are hosted by the hotel every night, too.